The old Ontario Plaza was built starting in 1956 at Mountain Avenue and Fourth Street and expanded in 1959 down to I Street. The nearly six blocks of shops and services marked Ontario’s transition away from the downtown core and into suburban-style shopping. The Plaza was torn down in 1998 for a new development, also named Ontario Plaza, but with an Albertsons, Rite Aid and other shops. Sunday’s column talks about the Plaza and notes many of the stores that were there. Feel free to comment here about your personal favorites or about any Plaza memories. The photo above was shot Friday morning on the northeast corner of Mountain and Fourth. It depicts what I believe is the only surviving portion of the Plaza. 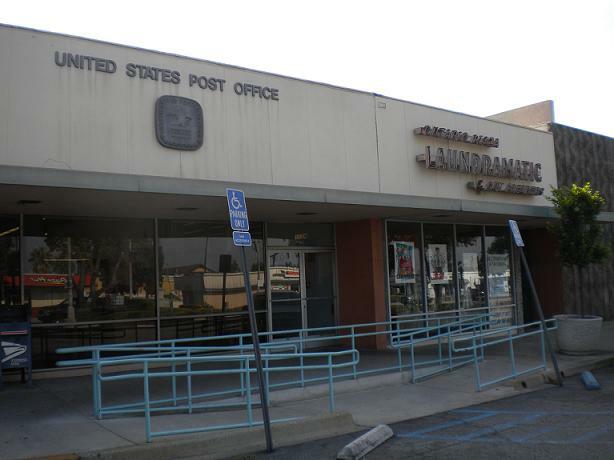 The post office and Laundramatic were original tenants, arriving shortly after the Market Basket supermarket, and the signs and architectural style look like they might be original, don’t they? This entry was posted in Around Ontario by David Allen. Bookmark the permalink. I had my first job in this plaza. There was a little Fox Photo booth directly across the street from the fire house on Mountain Ave. The booth was just down from the then-Thrifty’s drug store (now Rite Aid). It was a good first job! Lerners dress shop and Thrifty Drug store were two entities that immediately come to my mind. My husband bought me a coat at Lerners, in a brilliant color, a Christmas present, and I took it back and exchanged it for a black one. I have felt guilty ever since. Every time I go to the ice cream shop in Upland for the $1 Wednesday cone, I think back about the Thrifty ice cream cones at a nickel a scoop. I believe that the laundry at the east end of the strip mall on the north side of Fourth has been there forever. The Post Office is a sad place. I walked a piece of mail there on a Saturday, only to find out that it has to be closed on weekends to protect it from vandalism. The City of Ontario did a very good job of upgrading the Plaza on Mountain between Fourth and I Streets. I find it exasperating that the City is willing to put the life of this whole area in jeopardy by its plans for the Wal*Mart supercenter. Hi David, the Ontario Plaza between 4th and I sts. was the spot to hang out and cruise in the mid to late 1960s. Everything was close with the McDonald’s right down the street for cheap food. Shop owners didn’t particularly care for the cruising that occurred on most nights, particularly Friday and Saturday. Besides the cruising and hanging out, I imagine they were also concerned about “disagreements” between opposing “social clubs.” The main instigators were probably “The Sultans.” They took their name from Sultana Street around which many of the members lived. When the shop owners put up the speed bumps and the police started issuing citations for loitering… That pretty much killed it for the cruisers and probably made patrons feel more comfortable about shopping at the Plaza. Dave, the post office sign’s not original — that dates from the Raymond Loewy’s re-design when the United States Post Office was reborn as the USPS. I remember frequenting several stores at the shopping center. I remember ice cream at Thrifty. There were no Baskin Robbins or Cold Stones around. A nickel a scoop was a bargain. The Market Baskets sign comes to mind, and it was the first supermarket in that area. My favorite two stores were McDonalds and Arnolds Baby News. I spent a lot of time choosing clothing for my children at Baby News and for myself at McDonalds. I remember my 2-year-old hiding inside the circular dress racks when she thought I wasnt looking. I spent more time in the 1970s looking for her than I did dresses. I was very sad when they tore it down, but there was still Buffums. I had those ’70s polyester pantsuits and bell bellbottoms I purchased at McDonalds for a long time. I remember when I purchased a pair of Capri pants in the early sixties and paid $3.98 for them. That was a lot of money at the time. My other memory was of working at the Woolworth lunch counter when I was in college. It was there that I figured being a waitress wasnt my calling in life. I only made it for about a month. I finished college instead. The plaza spelled the death knell for downtown. Fallis Department Store and Atwoodss in Upland took over, along with South Lake in Pasadena. With regard to the post office, its pretty much the same. I often wondered to what use subsequent owners put the vault in the Bank of America. One final remark has to do with Armstrongs. It was another favorite place for gifts and Christmas decorations. I showed up dutifully the day after Christmas every year to take advantage for their 50% off sale on Christmas items. I was sad to see it hit the skids and go under the wrecking ball. One other note about Armstrongs, that wasnt the original Armstrongs. The original nursery was in downtown Ontario on Euclid Ave. I dont remember the date it moved. They also had their rose gardens and flowers far in south Ontario. They are now located in Carlsbad. Wow….what memories! My mom was the manager of the lunch counter at Woolworth’s. I remember going grocery shopping with my mom at Market Basket, all the workers knew us. It was there that I met my first boyfriend when he was stocking the dairy section. I also remember shopping for school clothes at Lerner’s, getting ice cream at Thrifty’s, using the Fox Photo booth, getting cakes from Ontario Bakery and going with my mother to get fresh meat from the butcher shop. And then there were the times my father, an Ontario police officer at the time (now retired), would take me with him to the post office. I was only 5 years old but felt SO grown up and privileged when he would hand me his post office box key and let me go get his mail for him. I still think of that to this day when I drive by that post office. What great memories of a time when life was much simpler. Had to accompany mom grocery shopping at the Market Basket, but usually convinced her that we needed a nickel cone from Thrifty’s for the ride home. When I went to Vernon Jr. High, Ontario Plaza was a closer walk than the mall on Indian Hill or movies downtown. My friend Janet and I would feel so grown up sharing a BLT at Woolworth’s after watching the cake decorating at the window of Ontario Bakery and then finishing the day browsing at Lerners. It’s possible our mothers appreciated those Saturday excursions more than us since they didn’t have to drive and we were gone all day. High school found me cruising and hanging out at the Plaza in the ’60s. Bought my wedding cake at Ontario Bakery as well as birthday, shower and anniversary cakes. Mmmmm, good memories. We would take our Thrifty ice cream cones with us and eat them while watching the cake decorating in the front window of Ontario Bakery. Ahhh..the BEST chocolate cake in town! Then we would wander down to Woolworths to check out the knickknacks. Beverly’s Arts and Crafts always had neat stuff too. Thrifty drug store had both a front and a back entrance. (As did Market Basket.) However, the liquor was stocked near the back door. The back entrance was eventually closed because they had too many cases of kids swiping cases of beer and running out the back to a waiting car! I moved to Ontario in Sept of 1957. I remember when it was under construction, buliding on to Market Basket. The Thrifty Drug Store that was originally there had a fire in the early ’60s and had to be replaced with a new one. My good friend Mike Hein worked and managed there thru out the ’70s. During construction my friend Howard Marshall and I would take soda bottles we could cash in for money at Market Basket. Speaking of the Market Basket, I remember the store manager’s name was Herman. Boy, what memories of the Ontario Plaza, OP, OP! I was a kid in Ontario in the ’60s and remember the ping pong ball drops from the helicopter in the back parking lot of the plaza. The balls would be marked with a prize. Mine was a pound of bacon from Jim’s Plaza Meats. I remember when Thrifty’s burned down in the ’60s, not once, but twice! I remember Herman and does anyone remember Norman who worked there? I think Herman gave him a job just to keep him busy. LOL. My father came up with the Ping Ball Drop idea. I can’t imagine they would get to do that today! He developed many promotional ideas during the 60’s and enjoyed watching people have fun. The comments here have brought back many memories. My father passed when he was only 66 years old. He worked hard to help the Plaza succeed. I remember Herman. My Dad was a friend of his. We live behind the Plaza on Rosewood ct. I have a lot of fond memories of the old place. Like many of you, we’d buy our 5-cent ice cream cones at Thrifty’s and walk up and down the sidewalk looking in the store windows. I don’t remember Norman or Herman at the Market Basket but I do remember the “picnic basket” sign. Nowadays, most people say they are going “grocery shopping” but I still say I’m “going to the market” and I think it’s because of my early shopping days at Market Basket. Armstrong’s was such a nice store with beautiful gifts and it smelled good in there too! The building had very tall windows that came to a point — like a ski lodge. I dropped off films at the Fox Photo Booth and bought my first Monkees album at Woolworth’s with change from my penny bank. The ping pong ball drops were a crack-up!! Everyone scrambling around trying to catch a bouncing ball and win a prize! That is so funny that Steve (see other comment) won a pound of bacon!! Any other ping pong ball memories out there? The Ontario Plaza brings back some great memories of growing up in Ontario in the mid 1950s to early 1960s. My friends and I used to ride our bicycles up to Thrifty’s to buy popsicles or fugdesicles. I think the popsicles were 50 cents and the fugdesicles were 35 cents. Sometimes we had to pool our resources and buy a popsicle and split it. In the summer of 1960 we would stop in at McCalley’s Union 76 gas station just below the Plaza. Union 76 was sponsoring the Dodger games on radio in those days. Seventy-six put out a series of booklets on each Dodger player; the booklets were known as the “Dodger family Album.” Believe it or not they were free for the asking! Something that would not happen today. I remember the candy counter at Woolworth’s and how good the fudge looked. I remember Grants and looking at the plastic models of buildings for model train layouts. One time a bomb shelter was put on display in the Plaza parking lot. Everyone had to step inside and check it out. All it was, basically, was a large steel barrel, but this was supposed to save us from the Russians. At least that’s what the guy who was selling bomb shelters told us. The event involving the Plaza that stands out had to do with my promotion from Vina Danks Jr. High in June 1963. My father documented the proceeding with a new Minolta camera. As he began “shooting” most of the time his finger was in front of the camera lens, but he got better as things went on. We took the film to Thrifty to be developed. There was no one hour developing in those days, it took about a week to get the pictures back. About a week later, in the early morning hours, we heard a huge explosion that shook the entire west side of town. My father, who was working in North Hollywood at the time, passed by the Plaza on his way to the freeway. That morning when he passed the Plaza he saw Thrifty’s had been leveled. The drugstore and my photos had gone up in the explosion! Later in 1963, my mother was getting her hair done at a hair dresser at the Plaza. That’s where she was when she heard the shocking news that President Kennedy had been assassinated. In addition to my earlier comments — Reading all of these comments make me feel like I’m right back in those days. So many people experienced exactly what I did, what a great feeling! I’ve been reminded about the back entrance to Market Basket (that’s where Mom and I would usually go in and out) and Herman the manager. I remember now we knew him by name as well as many workers. Going grocery shopping was an experience back then. And I forgot to mention that I would go with my father, who was an Ontario police officer at the time, to the cleaners next to the post office to drop off his uniforms and pick them up when they were all clean and pressed. I remember that so well! What a great topic David…you’ve helped so many of us re-live such a special time in our lives. Thank you! David, you stirred up memories with this one. While enrolled at Chaffey College I was hired at the soon-to-open J.M. McDonald department store (note corrected initials). This store was to bring “East Coast style” goods and shopping to our evidently shopping-challenged area. The eastern managment people made us all wear dark-toned “professional” dresses which I had to purchase for opening day. A dark professional dress? I was the gift wrap girl for goodness sake. Still, it was fun stocking the shelves with items relatively unfamiliar in the local Butler Bros. or Mode O’ Day stores. I remember getting reprimanded for allowing my boyfriend to hang around the gift wrap counter until closing time. Of course that was Paul and he was pretty annoyed that he couldn’t wait inside since he had driven all the way from the Boron Air Force Station just to take me to a movie. By the time of the ping pong ball drops I had moved on to work at then-Euclid Savings and Loan and could wear any color of my preference. The McDonalds Department store was great. I used to get my Levis there, along with the white T-Shirts and V-Neck Sweaters. MY father used to develop all of the advertising for the Plaza in a room upstairs at McDonalds. Lots of work because there were no computers, printers, etc. He would get to use their wrapping paper at Christmas time, which always made my father’s gifts look so special! I remember the ping pong ball drop. I think they actually did it twice. Hundreds of kids going crazy, a ’60s-style helicopter flying low over the parking lot dropping thousands of multicolored Ping Pong Balls filled with little pieces of white paper…I think, with numbers on them. The balls bouncing everywhere… with kids screaming with excitement as they raced each other to chase down every last one. I believe one year they also had an “Astronaut” with a jet pack that flew up and around the parking lot. Lots of fun and great memories! Would I be completely dating myself if I told you I remember going to the Ontario Plaza back when Mountain Avenue was a 2-lane road? My mom and I loved shopping for clothes at J.M. McDonalds and Lerners, and then walking up to the Thrifty Coffee Shop for lunch. I believe I recall a Ralphs Dime Store somewhere in the vicinity of Lerners, and I too remember Market Basket and Thrifty (as well as Cloth World) having front AND back entrances. I can still see my dad taking the tubes from our black and white TV set into Thrifty to test them. Yes, you could buy anything you needed at Thrifty, including TV tubes! Those were the days indeed. What great memories. My mom worked at Market Basket for 25 years. She was primarily the bookkeeper, but was called upon to check occasionally. I remember her memorizing grocery and produce prices in case she had to be a checker. No scanners in those days!! There was also a Thrifty Coffee Shop where we used to eat. I remember that Market Basket had the very best hot fudge sundaes ever. It was something about the rich vanilla ice cream and thick hot fudge that they used that made it so wonderful. I also remember the ping pong ball drop and how much fun it was for us kids. I remember going to Thrifty’s with my brother when I was young and my mother was visiting my grandfather who lived nearby. I’d buy Barbie clothes and my brother would buy accessories for his GI Joe. When I got older, my girlfriends and I would “cruise the Plaza” in my 1966 Ford Mustang. I’m 57 now and still have that Mustang! Karen. Cruising the Plaza was a part of our lives. My father who managed the Plaza had “speed bumps” put in eventually, and I got a lot of grief from my friends!! David, I never should have left the Ontario Bakery out of my original comments. We have purchased more family birthday cakes from there than I can count. My daughter’s wedding cake came from there — three sections of white, strawberry dream, and carrot cake. At work, we had a birthday cake pool, so the birthday person was honored with a cake from Ontario Bakery — the most popular one was “Chocolate Suicide.” If they still have it, chocolate lovers can get the best “fix” they ever had. Ontario Plaza: Wow, the memories are numerous. First, back to school clothes shopping was always either at J.M. McDonalds or Atwoods in Upland. I was always puzzled why a department store chain based in Hastings, Neb., would have a store in Ontario, Ca.? Also I remember the Grant’s 5 and 10 store and a Woolworth’s. I think when Woolworth’s left, Grant’s took over? The Market Basket seemed like such a big store for a small kid and of course Thrifty Drug and the nickel scoop of ice cream with the tube tester by the front door. Great time to be a kid! Don’t know if this “counts” as part of “THE” Ontario Plaza, but at the far south end (“D” Street and Mountain) there is a restaurant that was “originally” built/run as ALPHY’s Restaurant. The supermarket chain Alpha-Beta (sold to Yucaipa Companies in 1994, now branded as Ralphs) decided to build “Denny’s-like” restaurants on their parking lot properties at some of their stores during the 1970s. There was one Alphy’s on “D” Street and Mountain, and a second Alphy’s on Foothill, just west of San Antonio, in Upland (which now IS a Denny’s). BTW, the very first Alpha Beta Market (anywhere on earth) was opened in Pomona, in 1917. I have to add a comment about Armstrong’s Nursery. That would have been during the years that your columnist, Jack Christiansen, worked for them. It was a wonderful garden center but most wonderful of all was their gift shop. It was always decorated so beautifully during the holidays and then after Christmas they had the most wonderful sales of Christmas items. That is where I was able to start my first collection of “good” Christmas decorations along with Buffums’ after-Christmas sales in Pomona. For those that were not here at the time, you must understand that McDonalds was a quality store, similar to Nordstroms in the quality of their clothing and gift items, lovely, lovely things. The Ontario Plaza was the place to shop and meet friends. My mom worked at the Thrifty Drug Store for 15 yrs and was there when it burned down. I remember going to see the burnt out store and picking thru the rubble and retrieving watch bands (for some reason) and other things that smelled like smoke, even after bringing them home. My friends and I would visit my mom at Thrifty’s and she would give us a double scoop of ice cream for 5 cents! The Market Basket, Woolworths, Lerners, Ontario Bakery (and yes, I got my wedding cake there too! ), but I also remember one which no one has mentioned yet, a Kinney’s shoe store. They always had the perfect shoes for my daily wear, school shoes, and the perfect prom dress shoes for my proms at Chaffey High School. It was the place to meet friends and “hang out” until the Montclair Plaza was built. I also remember other hangouts in Ontario, like the A & W Root Beer drive-in on Holt and Wags on Euclid for a cherry coke and french fries. Oh, those were the days…. giving away an HO locomotive. Everyone stood in a line and Engineer Bill, my hero, walked in front of you holding an alarm clock in one hand. When the clock went off the person he was standing in front of won the locomotive. I didn’t win but I did get an Oscar Mayer Weinermobile whistle. Little Oscar was there also. It was great fun. the building playing on a big portable wood saw. When it fell over I ran home and never told anybody what had happened. I have a couple of memories, although I’m a little late to the game. First, my neighbor’s dad, Mr. Montoya, decorated the cakes in the window of Ontario Bakery. We’d watch and watch, but didn’t get to taste the icing. Last, I remember going on a ride in the parking lot carnival with Gerri, my next-door neighbor, the one where you stand up and it goes around and around. She bent over and vomited all over our legs. We went into McDonald’s and used the restroom to clean up. Don’t think the snooty clerk was too happy about that. Fun times. My father was the General Manager of Ontario Plaza from the early 1960’s through 1968. He paid me to hose down the sidewalk that ran from the Market Basket store to the McDonald’s department store at the far end every Saturday o Sunday morning. He managed many events there. Oscar Meyer Wiener Wagon was there for example. That was a fun day. We all got whistles. While in high school, I worked at Gallencamp’s Shoes and the Lerner’s Dress Shop. Would have lunch at the Woolworth Counter and I bought the first of many Beatles albums there. My father enjoyed his job there, and helped to make it a success, until the Montclair Plaza opened. Thanks for the glimpse into that period, William, when one might go to Woolworth’s, eat lunch and buy the latest release by the Beatles.